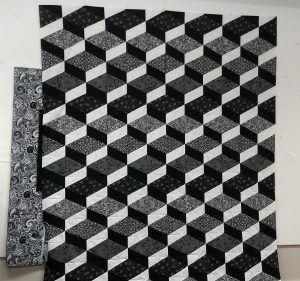 I shared a couple of my friends’ retreat quilts last week, so I thought I would share a couple that I pieced at Quilter’s Cabin. The one on the left will probably be donated to West Houston Quilter’s Guild for a charity quilt. 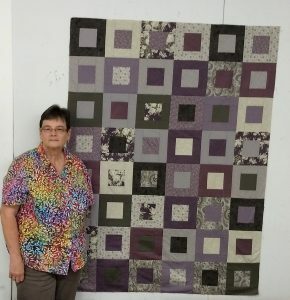 Our guild regularly donates quilts to Project Linus and to nursing homes. The one on the right does not have the borders attached, but it is going to be a wedding gift for my New York City niece. I was told by her sister that she likes black and white and gray, so I found what I think is a great pattern for a modern city girl. I’ll probably put it in my guild quilt show in March, so my niece will have to wait a while for her wedding gift.